We had a bunch of cereal boxes on top of the fridge, now they're next to it in this cart which rolls in and out very smoothly. You can leave off a shelf when assembling if you have less than 52 inches available but they also sell a shorter version. I gave this as a gift. My daughter was very happy with it. I have small apartment with little storage so I purchased this and I also got the Jubilee kitchen wax as I always used this to polish my appliances and counters years ago and was so excited to see it's back again! It make the kitchen and bathroom smell wonderful! there is just enough room between my counter and refrigerator for this to fit and it will give me added shelves in the kitchen, and I will be able to have my spices just about at my fingertips!!! 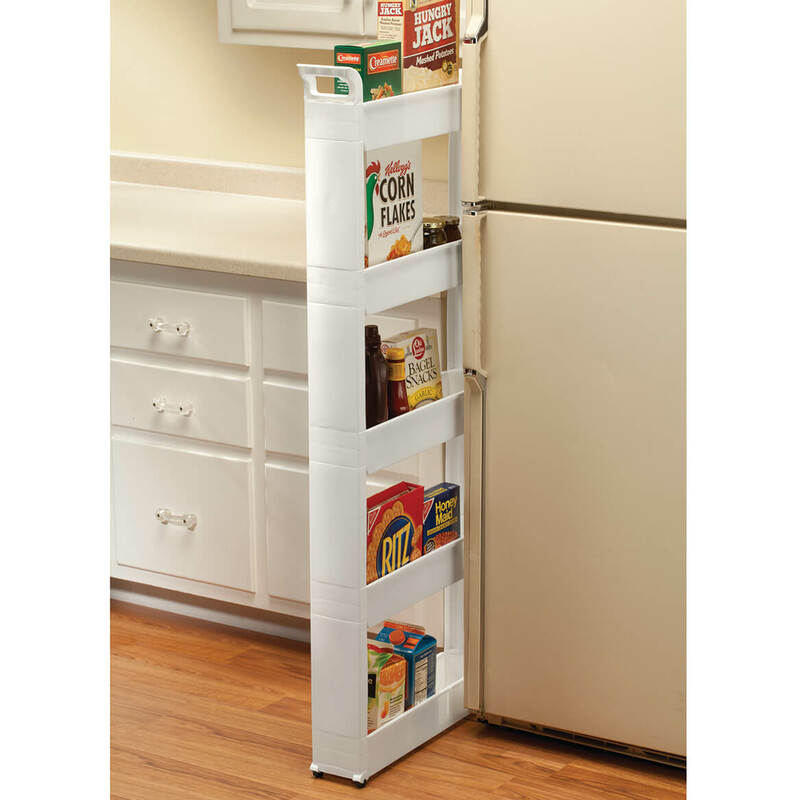 This is a neat way to store laundry detergent, dryer sheets and other cleaning items. Thin enough to fit next to my washer/dryer. Easy to assemble also. I chose this to utilize the space between my oven and cabinet. they make great bookcases for paper back books, of which I have hundreds. The 5" width makes this storage cart fit in very slim spaces- this is my 2nd order for this. Perfect fit between wall & refridgerator. I now have a small kitchen and need every each of storage space that I can get. This was perfect! How wide is the cart? BEST ANSWER: Thank you for your question. The cart is 21" long x 5" wide x 52" high.We hope this information will be of help to you. Will cookie sheets fit on the shelves? BEST ANSWER: Yes but not the really big kind (like greater than 17 inches). you can lay them on their size. it also fits cupcake pans. I used my tier in an 8inch opening between the fridge and oven to hold those very pans. works nice. a bit wobbly but better than leaving the stuff on the floor. 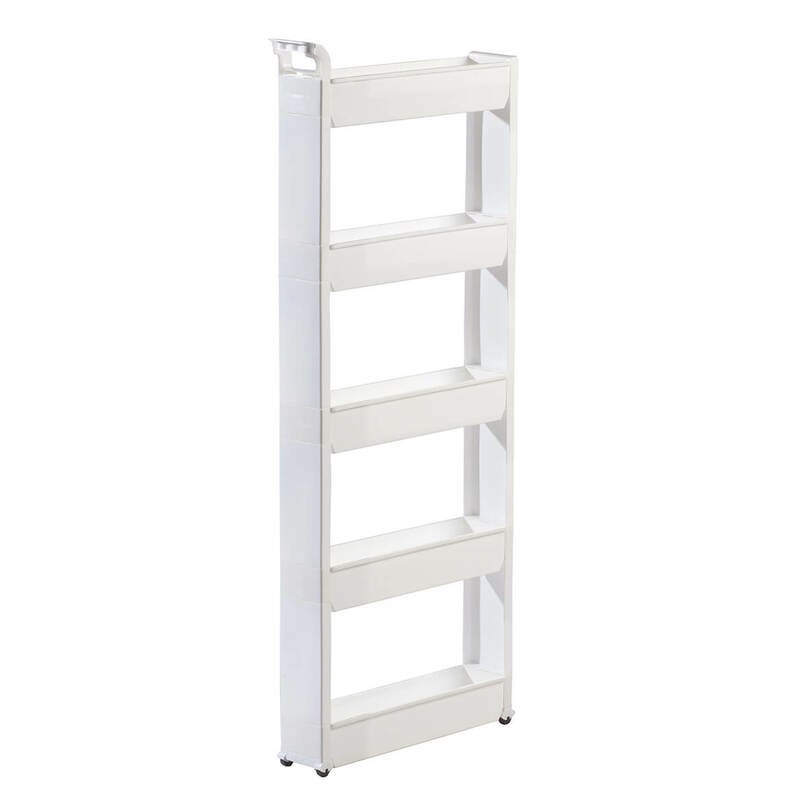 Is is possible to order 2 additional shelves to an order? If so I’d like to order. BEST ANSWER: Thank you for your question. We are not able to add anymore shelves to this. It is a five shelf cart only. We hope this information will be of help to you. Can you leave a shelf out to make it shorter? I only have 35 inches of height. BEST ANSWER: Thank you for your question. You can leave a shelf out but it will now shorten it as the sides are the standard size of 52". We hope this information will be of help to you.